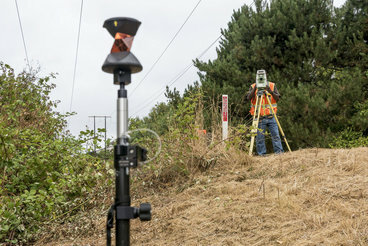 As the largest natural gas utility in Washington, PSE understands pipeline safety concerns and employs safe procedures when working near pipelines. PSE approaches every project, from the smallest natural gas service installation to the largest transmission line, with the same priority: the safety of our customers, the communities we work in, and our fellow co-workers. For Energize Eastside, PSE will continue to follow all federal and state safety regulations to maintain safety in the corridor. This includes building and operating the project to meet strict federal standards that govern both pipeline and transmission line infrastructure. The backbone of our transmission system on the Eastside shares a utility corridor with Olympic Pipe Line Company's (Olympic) underground petroleum pipelines. Olympic and PSE have shared this corridor for more than 40 years. Uses new, longer-lasting equipment, and fewer poles that will typically be farther away from the pipelines than the poles are today. Maintains at least 13 feet of distance between the pipelines and the pole grounding system. Meets or exceeds industry standards to address seismic, high winds and ice loads. Operates both transmission lines at the same voltage to reduce the potential for pipeline interaction. A third-party safety inspector who independently monitors construction activities in collaboration with our safety staff. Engineering survey work, including the use of advanced ground-penetrating radar to locate subsurface utilities. Site preparations, including confirmation of utility locations, prior to any ground-disturbing activity to ensure there is no interaction with existing facilities. 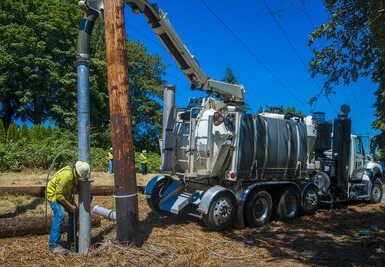 Use of specialized excavation techniques (e.g., air or water vacuum excavation and hand digging). Use of Olympic-approved equipment and vehicles for construction and facilities access. Use of temporary coverings, such as steel plates, to distribute the weight of equipment and protect existing utilities. After construction ends, PSE will continue to coordinate with Olympic to ensure the safety of day-to-day operations. In 2007 and 2008, PSE worked with Olympic to replace more than 130 poles and reframe more than 200 poles in the existing corridor. In 2015, PSE successfully completed more than 50 geotechnical investigation borings within the existing corridor. Half of these geotechnical borings took place in the vicinity of the Olympic pipeline. In June 2016, we replaced two pole structures adjacent to the pipelines to address an imminent safety concern created by the construction of new apartments in Newcastle. We met onsite with Olympic's Damage Prevention Team to review construction activities and coordinate safe construction practices. As described in the Final EIS, new construction will entail close coordination between PSE and Olympic, and no significant adverse impacts related to work near pipelines are expected. To review the EIS analysis, visit EnergizeEastsideEIS.org/library. Review our corridor safety Frequently Asked Questions document to learn more.